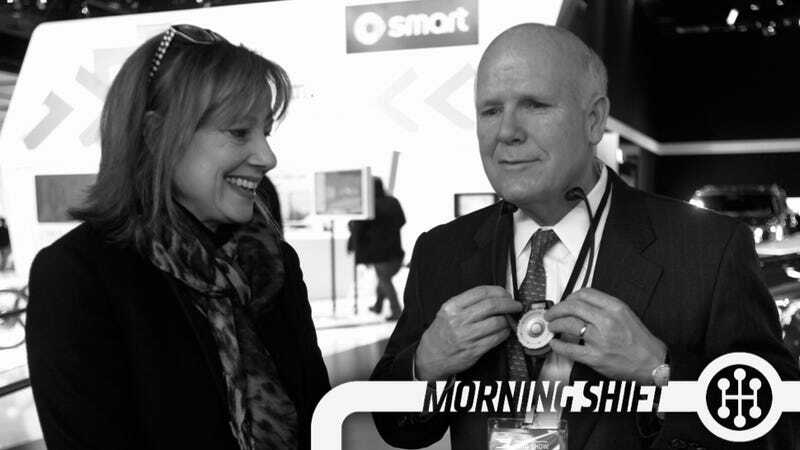 There's a dumb but persistant theory that says Dan Akerson decided to leave GM just as they knew this recall was about to happen so that they could have a woman at the top (Mary Barra) to deflect all the blame. Akerson finally came out to talk today and called this idea, basically, dumb,. Akerson said speculation that GM managers purposely hid information from Barra — or that he left her with the mess — was ridiculous. Internet chatter implying that GM could soften criticism of its mishandling of the recall by promoting the first woman to lead an automaker, Akerson said, only shows that "fools can say anything." 1. Akerson either faked his wife's serious cancer battle, or used it to get out of being CEO. 2. The members of the board (many of whom are women) and Akerson himself all decided their prized protege was going to take the fall. 3. They've known for longer than they let on that they had a serious problem, and continue to stall for months even though that stalling was obviously going to hurt them. 4. They somehow thought a 30-year GM lifer would be better than a relatively new finance car not a part of the GM culture. 5. GM is even smart enough to pull that off. I don't buy it. Mark Reuss is the way better fall guy, if we're being honest, for all the reasons that we like Mark Reuss. It would be wrong to ascribe Nissan's quarterly profits and recent success entirely to the value of the Japanese yen. They've built popular, if slightly safe, products recently. They've expanded their production footprint. They've started to improve Infiniti. The cheap yen continued to boost Nissan's earnings. Japanese exporters get a perk because it lifts the value of overseas earnings. Nissan said the company gained several billion yen in operating profit from the currency rate but declined to give a specific number. Bad timing Nissan. Don't tell everyone you just made a bunch of money and then try to get your friend to pickup the check for dinner. According to Reuters, Corporate Vice President Joji Tagawa told reporters that Nissan wasn't going to pay for the more than 750K cars recalled over potentially explosive airbags. As part of the labor deal, GM reversed an earlier decision not to make the next-generation Chevrolet Cruze at the Gunsan plant. However, the new Cruze will not be produced until 2017, according to GM's proposal to the union that was seen by Reuters, meaning the Gunsan plant may remain underutilized until then. America's biggest and most dysfunctional carmaker won't have to recall the 2007-2009 Outlook/Acadia over a defective headlight. VICTORY FOR GM! THERE IS ONE VEHICLE THEY DON'T HAVE TO RECALL. An owner of the 2007 Outlook was heard to say "This is the first time I've ever felt fortunate to own a 2007 Saturn." The Italian race car driver Tazio Nuvolari wins the greatest victory of his career in the Grosser Preis von Deutschland (German Grand Prix) held on the Nurburgring racetrack in Nurburg, Germany on this day in 1935. Neutral: Do you believe Barra is the Fall... urm... Lady? And if so please provide any proof.